Can a college town hangout translate into the city? A country mouse become a city mouse? Such is the question for the new Thai Canteen on 16th Street. The original Thai Canteen sits on the main drag of Davis, a popular place for college students. 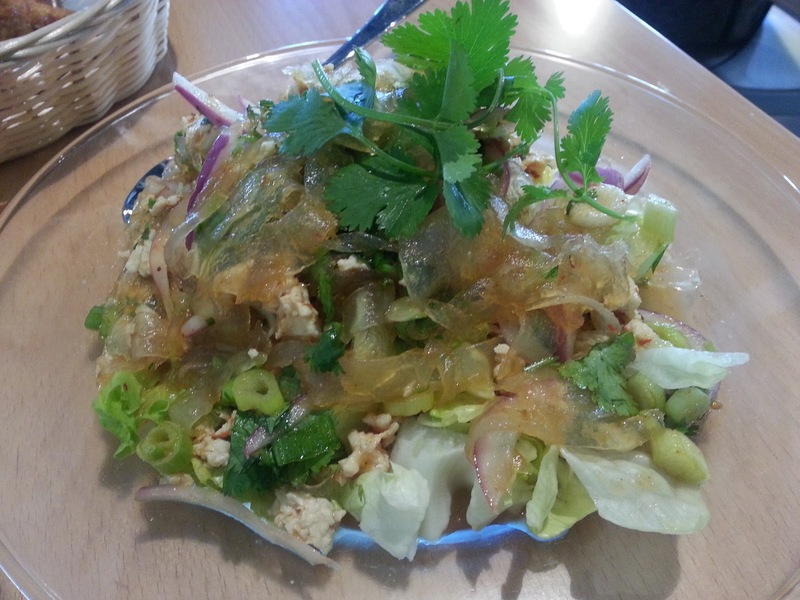 Now the owners have opened a second location in Sacramento in the space formerly occupied by Mati's Indian. We stopped in for lunch to find the place completely transformed. Even the facade of the restaurant is new with wooden (bamboo?) framing for the windows and doors that give it a more welcoming feel than the stucco of the building it occupies. Inside you will find a couple of long picnic/communal tables and not all that many individual tables. There are plenty of counter seats, though, along the window, bar, and outside railing. The service is organized as fast casual. The menu is posted above with specials written on a roll of butcher paper by the cashier. Place your order, take your number card stand to a table, and await delivery. The food is delivered, water is refreshed, and you leave the dirty dishes behind for them to clean up. I ordered the Yum Shiang Hai - translucent shiang hai noodles, minced chicken, tossed with roasted chili paste, shallot, and lemongrass. The serving was large, but it's a light salad. They used ground chicken and were a bit heavy handed on the dressing. The noodles with excess dressing made it quite slippery to eat. 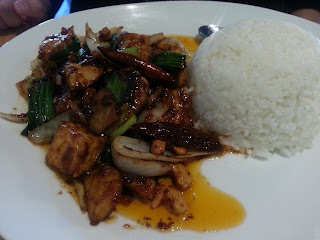 My friend had the Pad Med Mamuang - stir fried cashews, water chestnuts, onions, and roasted chilies. She opted for tofu. 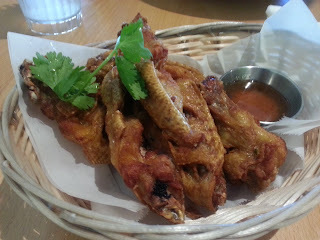 I also ordered a side of Peak Gai Tod, or fried chicken wings, with came with a sweet chili oil. These were piping hot and I found it curious how they cut diagonal slashes through the wing meat, presumably for the hot oil to reach every bit of meat. We finished it off with the sticky rice with mango. This was white versus purple and my only complaint was it lacked the drizzle of coconut milk that gives just that little bit of moisture and sweetness it needed.